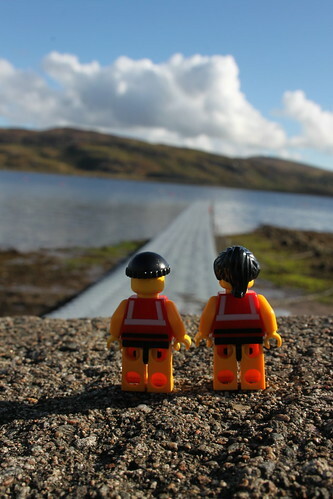 During their recent trip to Scotland, the little guys had the pleasure of spending a week in the rather excellent village of Tighnabruaich. Situated on the picturesque Kyles of Bute, Tighnabruaich is part of ‘Argyll’s Secret Coast’ and is a popular sailing destination for those intrepid enough to venture this far north. 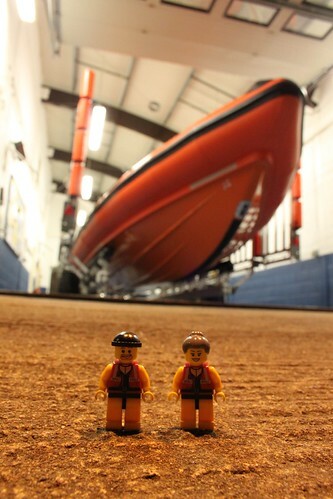 The station was founded in 1967 with a D class lifeboat, which was kept in a boathouse in the grounds of the Tighnabruaich Hotel. The station swapped the D class for a C class in the early 1990. In 1998, the C class was itself swapped for a larger Atlantic 75, which was in turn replaced by the station’s current Atlantic 85. The present boathouse was built in 1997 and is situated right on the shores of the Kyles of Bute. 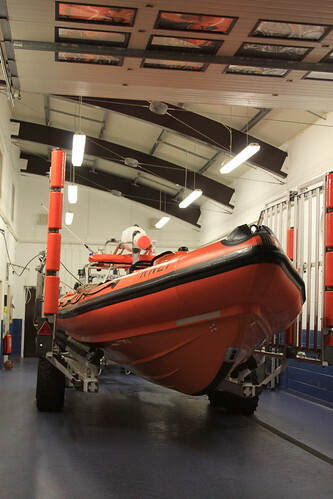 It has a slipway for launching the boat as well as a new floating pontoon extending out towards the Isle of Bute. The station has a considerable operating area, too, stretching around the Cowal peninsula and well up into Loch Fyne – almost an hour from the station at top speed. 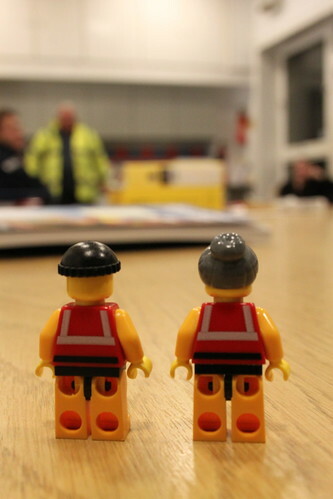 The little guys had timed their visit to coincide with one of the station’s training sessions, so were delighted to meet Lifeboat Operations Manager (LOM) Ronnie and members of the crew. 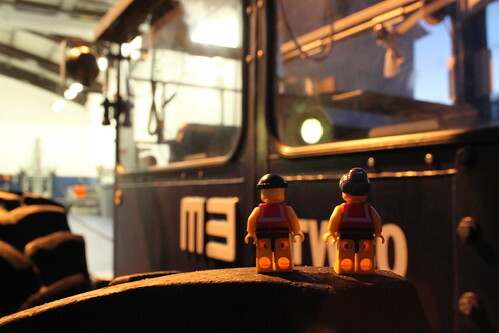 They hung out for a while in the crew room upstairs in the boathouse, learning about the station’s history, and were then invited (to their great excitement) to have a look around the boat hall. The little guys felt somewhat dwarfed by the tractor’s huge tyres, but that’s quite a common feeling when you’re only an inch and a half tall. And they were soon distracted by the Atlantic on her carriage, freshly washed and ready to launch at a moment’s notice. 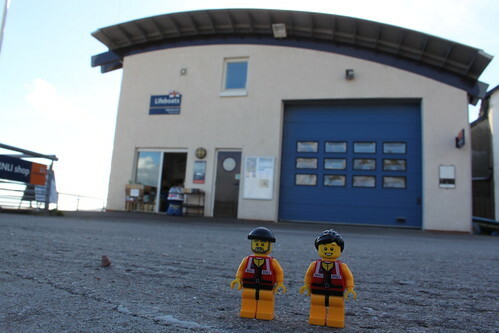 So a massive thank you to the crew at Tighnabruaich for their hospitality and for taking the time to show us around and to tell us all about their fantastic station. We hope to see you again soon! 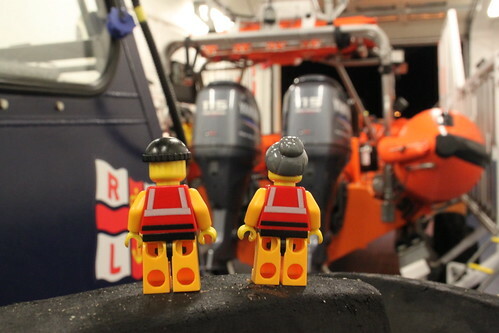 This entry was posted in Out and about and tagged Lifeboats, RNLI, The Lifeboat Crew, Tighnabruaich by Simon Perks. Bookmark the permalink.